When people begin to get phone calls from relatives that had passed away, a whole town is flummoxed. People begin to come from far and wide to experience this miracle and the residents of a small town near Lake Michigan find their lives quite changed. While some are touched, others are shaken, and Sully Harding is angry. He wants to prove that this is not a miracle but a hoax. Mr. Albom weaves a story around faith, hope, belief, love, and second chances. I love Mitch Albom. He focuses on faith rather than a particular religion and it is easy to feel inspired. The story is told through the eyes of multiple characters who live in the small sleepy town but there is a special focus on Sully Harding who is just returning home after a stint in prison. I couldn't put this one down because I wanted to know whether it was a hoax but I wish the middle had progressed a bit faster. Actually, I wish some of it had been cut out together to make room for a bit more in the end. The end was too rushed for my taste. Even though Sully Harding is trying to prove the phone calls are a hoax this story doesn't feel like a mystery at all. It felt like a personal story and it allowed the reader to become close to multiple characters. I found myself reflecting because each character gave me something new to think about. Sully's background regarding the plane reminded me of a rather recent movie but I can't think of the name of it off the top of my head (Denzel Washington played in it...anybody?) but this bothered me a little bit. Overall, an easy quick inspirational read. I didn't find the message as clear as in previous Albom books but I felt inspired all the same. Geez, I managed to lose my own comment. Lol. Ok let's start again. I loved this book too as you know. I do agree on the ending though. It could have been more developed than it was. Still I adore his books and they always leave me feeling better for having read them. I bought this on audio but I'm taking my time with it. Mainly 'cause it makes me cry a lot. I lost my dad two years ago and what I wouldn't give to get a call from him. Great review! I have an ARC of this one to review soon...I can't wait to read it. 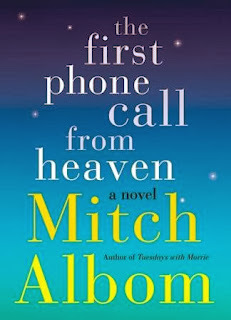 The Five People You Meet In Heaven is one of my favorite all-time novels, and I've been an Albom devotee ever since. I'm thinking of placing this on my 2014 TBR list. wish i didnt have one of those. lol. I'm glad you found this book inspiring! Thanks for being on the tour.